Whatever your moving needs may be, our San Miguel movers will help you feel right at home. Our professionally trained student-athlete movers and moving concierge service will be with you for the entirety of your move. If you are moving to or from anywhere in San Miguel, we are the moving company for you! Our San Miguel movers are professionally trained student-athletes, and our moving concierge service will be there to help you with every stage of your move. San Miguel is a quaint and peaceful town in San Luis Obispo County. The San Miguel area offers hidden wonders and a rich history with Mission San Miguel Arcangel located within the city. With beautiful vineyards and wineries, horse and cattle ranches, San Miguel will take you back to a simpler way of life. 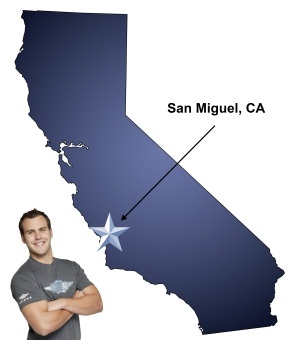 If you are considering a move to the beautiful area, our San Miguel movers are here to help. Our moving company specializes in local, long-distance, and commercial moves to, from, and within San Miguel. We also provide reliable packing, storage, on-site relocations, and our distinctive moving concierge service, which connects you with local service providers. All our student-athlete movers are thoroughly screened and trained before their first move. With branches not just in San Miguel, but all throughout California, we are your one-stop resource for all your moving needs, no matter where your California move takes you. In fact, you can see what your neighbors in San Miguel have to say about us. With our 100% satisfaction guarantee, the only thing you have to lose is the stress that comes from moving! So contact us today for a free no-obligation moving quote and to learn how we can help you on your next move! Moving to San Miguel? Here are some helpful resources. View more San Miguel resources. They were on time with the right equptment and people. Everything went smooth with no issues. They went above and beyond. They came in and removed my things and placed them in my storage nice and neat. Thank you for all your help during this stressful time. The guys that you sent were the best! Carlos & Jack made our move seem less. The guys were very efficient, professional, polite and always smiling. They worked hard Tobey, Jordan and Jared were awesome and so helpful. The entire experience with Meathead Movers was great from the start, very friendly staff!